“History is instructive”, said Howard Zinn. As I was telling you a few days ago, it’s becoming increasingly important to me to learn about the history of social movements. All the hard won rights that make the life of a woman like me so much more bearable than it would have been one or even half a century ago are the result of people coming together to fight for them. I’m interested in learning about these people — particularly about the circumstances that made it possible for them not to succumb to hopelessness or exhaustion. Furthermore, this often overlooked side of history is a vivid reminder that our actions matter; a reminder that can be life-giving when so much of the world makes us feel powerless and discouraged. When I started researching and putting together this reading list, I felt the same sort of hope and excitement I remember feeling when I first started doing more in-depth reading about feminism. Then it occurred to me that sharing this list with others might be useful. The books I’ve found so far are very UK and US-centric, which is something I’d like to change. If you have any suggestions for history, biographies, memoirs or essays along these lines, I would be very, very grateful if you shared them. I have an informal goal of reading at least four of the following books this year (I already own the first, so I’m on the right track). These days I always think twice before committing to any sort of formal reading challenge, but I think doing my best to stick to this one would do me good. Howard Zinn, author of A People’s History of the United States, tells his personal stories about more than thirty years of fighting for social change, from teaching at Spelman College to recent protests against war. A former bombardier in WWII, Zinn emerged in the civil rights movement as a powerful voice for justice. Although he’s a fierce critic, he gives us reason to hope that by learning from history and engaging politically, we can make a difference in the world. Based on the first-person accounts of servants, factory workers, miners and housewives, award-winning historian Selina Todd reveals an unexpected Britain where cinema audiences shook their fists at footage of Winston Churchill, communities supported strikers and pools winners (like Viv Nicholson) refused to become respectable. Charting the rise of the working class, through two world wars to their fall in Thatcher’s Britain and today, Todd tells their story for the first time, in their own words. Uncovering a huge hidden swathe of Britain’s past, The People is the vivid history of a revolutionary century and the people who really made Britain great. Angela Y. Davis’ life and work have been dedicated to examining this fundamental question and to ending all forms of oppression that deny people their political, cultural, and sexual freedom. In this collection of twelve searing, previously unpublished speeches, Davis confronts the interconnected issues of power, race, gender, class, incarceration, conservatism, and the ongoing need for social change in the United States. In this much anticipated book, Dorothy Sue Cobble retrieves the forgotten feminism of the previous generations of working women, illuminating the ideas that inspired them and the reforms they secured from employers and the state. This socially and ethnically diverse movement for change emerged first from union halls and factory floors and spread to the “pink collar” domain of telephone operators, secretaries, and airline hostesses. From the 1930s to the 1980s, these women pursued answers to problems that are increasingly pressing today: how to balance work and family and how to address the growing economic inequalities that confront us. These diverse authors challenge the common misconception that today’s young people are apathetic, shallow, and materialistic. Aged ten to thirty-one, these atheist, Christian, Jewish, Muslim, pagan, transgender, heterosexual, bisexual, metrosexual Americans are from every type of background and ethnicity, but are united by their struggle toward a common goal. They are the inheritors of their parents’ legacy from the sixties, but also have the imagination and courage to embark on new paths and different directions. In letters addressed to their parents, to past generations, to each other, to the youth of tomorrow and to their future selves, each author articulates his or her vision for the world as they work towards racial, economic, gender, environmental and global justice. Hailed in a starred Publishers Weekly review as a work of impressive even-handedness and analytic acuity that gracefully handles a broad range of subject matter, this is the first comprehensive look at American history through the prism of working people. From the Montgomery bus boycott to the lunch counter sit-ins to the Freedom Rides, Lynne Olson skillfully tells the long-overlooked story of the extraordinary women who were among the most fearless, resourceful, and tenacious leaders of the civil rights movement. Freedom’s DaughtersM includes portraits of more than sixty women — many until now forgotten and some never before written about — from the key figures (Ida B. Wells, Eleanor Roosevelt, Ella Baker, and Septima Clark, among others) to some of the smaller players who represent the hundreds of women who each came forth to do her own small part and who together ultimately formed the mass movements that made the difference. In July 1888, fourteen hundred women and girls employed by the matchmakers Bryant and May walked out of their East End factory and into the history books. Louise Raw gives us a challenging new interpretation of events proving that the women themselves, not celebrity socialists like Annie Besant, began it. She provides unequivocal evidence to show that the matchwomen greatly influenced the Dock Strike of 1889, which until now was thought to be the key event of new unionism, and repositions them as the mothers of the modern labour movement. Returning to the stories of the women themselves, and by interviewing their relatives today, Raw is able to construct a new history which challenges existing accounts of the strike itself and radically alters the accepted history of the labour movement in Britain. Challenging Authority argues that ordinary people exercise extraordinary political courage and power in American politics when, frustrated by politics as usual, they rise up in anger and hope and defy the authorities and the status quo rules that ordinarily govern their daily lives. By doing so, they disrupt the workings of important institutions and become a force in American politics. 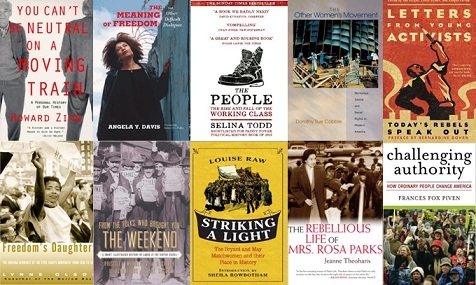 Drawing on critical episodes in American history, Frances Fox Piven shows that it is precisely at those seismic moments when people act outside of self-restricting political norms that they become empowered to their full democratic potential..
Have you read any of these? If so, I’d love to hear what you thought. Oh, I want to hug you so hard for this - SO glad you decided to share it and I love that it covers such a wide variety of people and movements. :D I'm glad you enjoyed it and thanks again for tweeting it! I know the feeling. I'm really, really looking forward to reading the Zinn book. I think I'll probably started when I finish my current non-fiction. I REALLY want to read something by Angela Davis—so much of her work keeps appearing in my Goodreads recommendations, and it all sounds so fascinating and important. Same - I've been meaning to read her for ages and I can't believe I still haven't. And you're welcome! I'm so glad you did decide to share this, Ana! I know I, for one, will be using this list. Thanks! It's UK-centric, but I recently read Emmeline Pankhurst's memoir, Suffragette, and found it a fascinating discussion of why protestors sometimes turn to violence. Some of what she has to say was remarkably relevant to protest movements today. Thank you for reminding me of that! It's been curious about it ever since the new edition came out. O.K. ... you've just given me a new homeschool curriculum for my teens. :-D This is wonderful! One of my favorite university courses was a sociology class on social movements. That sounds like a class I'd have really enjoyed. Hope you and your teens enjoy whichever books you pick up! What a great list! I'm so glad it's helping you. Booooooooooks <3 I've started Zinn's memoir and it keeps making me tear up (in a good way). I want to hug this post. Thank you thank you thank you!. I just read a post on Sophisticated Dorkiness recommending 5 nonfiction books, and I commented that I felt remarkably compelled to read all of them. Now, not two minutes later, I am feeling that same need after reading this post. In less than five minutes, I added a generous handful of books to my to -read list.